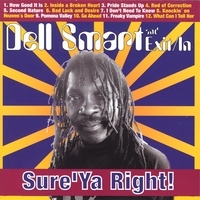 Dell Smart is an authentic dread locked singer from Belize where he had his share of hits with "Dell and The Sensations". The "maan" has released over 10 albums throughout his career and his music can still be heard on the radio in California, Hawaii and all over the Caribbean. The band has just released their new CD "Sure' Ya Right!". From the blues of "Inside A Broken Heart" to the fast paced "Pomona Valley" to a reggae version of Bob Dylan's "Knockin' On Heavens Door", Dell & Exit/In showcase their ability to write and perform in a variety of styles. Special guests Vykki Vox, Paul Rishell and Ronnie Earl also lent their amazing talents to the album! With our large selection of original songs we take the crowds cruisin' the caribean for a highly energetic, dance filled and fun night! This CD is awesome. If you like the island sounds.. you'll love it.